Please be reminded that the next two weeks are shortened weeks: Wednesday, April 17 and Thursday, April 18 are early release days. There is no school on Friday, April 19 and no school on Monday, April 22. AISJ prioritizes the safety of our children and community members. 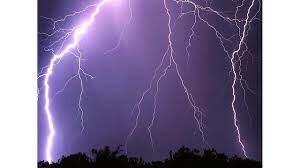 The dangers of lightening are very important for all of us to understand and your help of reinforcement of information and safety procedures are appreciated. Please help us set the best example for our students and model safe behaviors. We have systems in place to monitor lightening and utilize an alarm system and a stay put drill when we are at high risk of direct and indirect lightning strikes. Our students know to move under cover as quickly as possible. It is important to follow safety procedures and instructions when you are on our school campuses. Thank you for helping us reinforce the dangers of lightening and the importance of safety procedures during lightening alerts. Remember when you were new to AISJ? Did you have a few questions? We have a parent buddy system that pairs incoming families with veterans like you! We need your help! Please email Kia Phillips at akia2007@gmail.com and volunteer to be one of our parent buddies, please include PARENT BUDDY in the subject line. It will be easy on your end and priceless to our new families coming in! The children and teachers at Meetse A Bophelo Primary in Mamelodi were thrilled with the four new rugs the PA purchased with funds from our events for the Grade R classrooms. 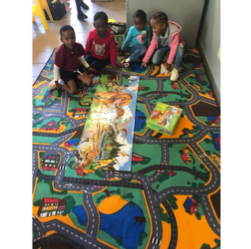 With 40 children in each class, the rugs allow the children to spread out and work on cooperative and play-based games and activities without having to sit on cold tile. Thank you to our parent volunteers who help support our work there! 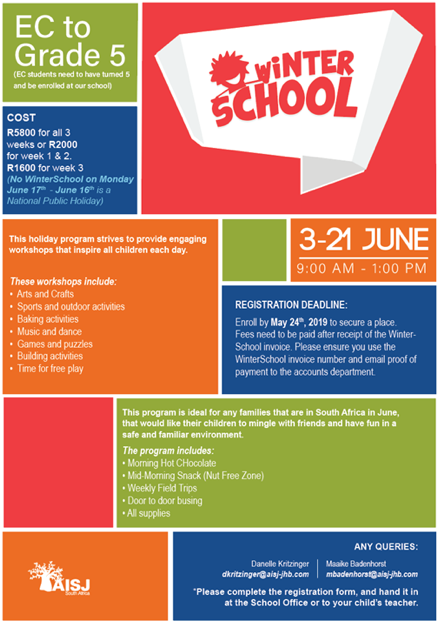 AISJ will be hosting Winter School from 3-21 June. If you are in Pretoria during that time, we would love to have you join in the fun! Your child will receive a registration form in class. To view or print, please click on the following link Winter School Registration Form Please return it to school on or before May 24th. Contact Maaike mbadenhorst@aisj-jhb.com or Danelle dkritzinger@aisj-jhb.com should you have any questions. Enjoy Friday and the weekend.